Inspired by faith, Latin culture and childhood memories, Misha Lulu is a Retro-modern boutique girls clothing brand. Misha Lulu uses art, nature and family as the foundation for their collections. Misha Lulu clothes is hand crafted in the USA and is unique in both style and craftsmanship. Garments are made from eco-friendly and organic fabrics and feature one-of-a-kind screen prints, appliques, vintage-inspired buttons and other darling details. But Misha Lulu's attention to detail goes even further - most pieces are created using Misha Lulu's own fabrics that cannot be found elsewhere. Each Misha Lulu piece will put a smile on your and your little one's face and is sure to become your girl's go-to outfit. Misha Lulu Spring 2012 collection is a huge hit. Following Fall 2011, Misha Lulu's designer, Karen, continued her collaboration with Hello Kitty to create two charming lines, Misha Lulu Good Life Hello Kitty and Misha Lulu hello Kitty Nautical, that feature iconic character planting organic veggies in her garden or cruising in her darling little sailboat. One of these collections, Good Life Hello Kitty is already in stock and can be purchased at My Little Jules boutique. Hello Kitty Nautical should be shipping to us in the next 10 business days, so all orders will be filled by the end of April. In addition to two Hello Kitty collections, Misha Lulu dazzled its fans with smile-inducing Misha Lulu Magic Circus line which has received a word-wide recognition and has been featured in many kids fashion magazines like MoodKids and Babiekins. The biggest seller from the Magic Circus line has been Circus Dress. Although colors appear slightly muted on the modeled image provided by Misha Lulu due to picture styling, the dress features very bright, almost florescent pink, and yellow colors. 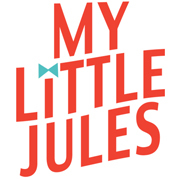 At My Little Jules boutique, first-time customers engoy 10% discount with code WELCOME. All US and Canada customers free shipping on orders of 69 and up, no coupon code needed.